Note: This is the standard retail edition. See them tear each other apart. The see what they do with the pieces. 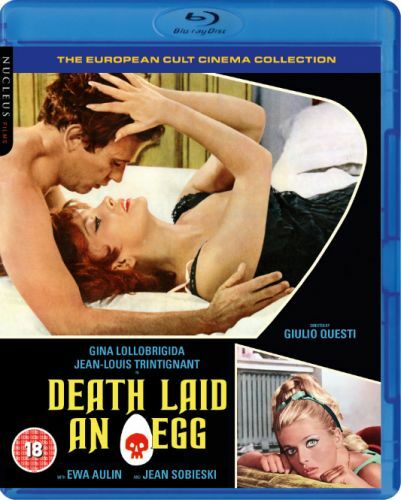 From Giulio Questi, acclaimed director of DJANGO, KILL! (IF YOU LIVE SHOOT!) comes one of the most startling and shocking Italian thrillers you will ever see. It craftily subverts conventions and transcends its genre roots with a tale of genetically modified meat, greed and murder at a rural poultry farm! 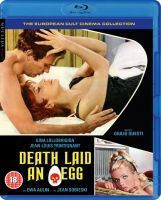 Anna (Gina Lollobrigida, TRAPEZE, BEAT THE DEVIL) and Marco (Jean-Louis Trintignant, THE CONFORMIST, TRANS-EUROP-EXPRESS) run an automated state-of-the-art facility and develop a strain of boneless, mutant chickens. Compellingly crafted, brilliant and bizarre, this is a one-of-a-kind murder mystery. It boasts a thematic depth and richness – including a savage and subversive attack on the established order – that elevates it above and beyond Italian genre cinema of the era. This COMPLETE AND RESTORED DIRECTOR'S CUT, a home video WORLD PREMIERE, has been painstakingly restored and remastered in high-definition from the original negatives. Nucleus Films are proud to present DEATH LAID AN EGG alongside the alternate "giallo" version, together with a treasure trove of bonus special features in the definitive release of Questi's masterpiece of mystery and murder most fowl! Gina Lollobrigida, Jean Louis Trintignant, Ewa Aulin, Jean Sobieski, Renato Romano, Vittorio André, Giulio Donnini, Biagio Pelligra, Cleofe Del Cile, Monica Millesi, Ugo Adinolfi, Conrad Anderson, Aldo Bonamano, Rina Del Fillipo, Livio Ferraro, Mario Guizzardi, Margherita Horowitz, Barbara Pignaton, Giuliano Raffaelli, Jean Rougeul, Giancarlo Sisti, Ludmil Trifonov.